They say competition brings out the best in people. Is that true? In my experience, it’s not. There are other factors at play. If you want to compete to win, you should understand these factors. First and foremost, it’s important to recognize that people who are highly engaged in their employment situations are more likely to be interested or motivated to compete to win. Those who are less engaged may not really care much and aren’t all that interested in putting forth extra effort to help the company compete to win. Those who are disengaged may even sabotage or undermine efforts to compete to win out of bitterness, anger or apathy. It would be ridiculous to assume everyone on your team is highly engaged. Some may be, but others most likely are not. Do you have a good sense of the engagement level of your people? According to a 2018 report by Gallup, 70 percent of American workers are not engaged. Does that surprise you? The report also states that only 29 percent of frontline managers are engaged, and, even more surprisingly, only 45 percent of executive managers are engaged. This lack of engagement among managers creates a cascade effect throughout the organization. If the leaders aren’t engaged, why would anyone else be? One way to measure employee engagement is by using an online assessment tool from Gallup called Q12. This tool measures engagement in 12 areas, giving management insight into what needs attention. A best practice is to establish a baseline measurement and then compare future measurements to monitor progress. One of the 12 areas of the assessment has to do with professional development. Gallup data show that a lack of development and career growth is the No. 1 reason employees leave a job. With today’s labor shortage, it has never been more important to invest in professional development. When people are being invested in, learning and growing, they are more likely to be engaged. They are more satisfied, less likely to be recruited away and more likely to care about the company’s competitive position and ability to win in the marketplace. Of course, the opposite is true, as well. What are you doing to promote deeper engagement levels among your people? Another factor in play is that not everyone is wired the same way when it comes to competitiveness. It’s likely that you have people on your team who represent each of the following types of individuals. Each category of person presents a challenge for leaders to elevate the engagement level. Understanding which category your people fit into is a good starting point. The first type is the person who is highly competitive—the person who has to win at everything. To them, losing is never an option. A loss is the end of the world. They can’t stomach seeing someone else being recognized for what should have been theirs. They don’t just want to win, they have to win. Who do you know that falls into this category? Leaders of highly competitive people should be aware that competition sometimes brings out the worst in them. Find opportunities to use their competitive spirits to motivate and inspire others on the team. The second type is the person who enjoys competition and winning but isn’t upset by losing. They want to win, but losing is not the end of the world. As long as everyone gave his best effort and nobody got hurt, it’s all good. They are just happy to be part of the team. My grandmother used to watch every Detroit Tigers game religiously. If they lost a game, she would inevitably proclaim, “You can’t win ‘em all.” She never lost any sleep over a loss. Who do you know that falls into this category? Leaders of this second type of person should look for opportunities to link incentives and rewards to winning. The third type of person is not at all competitive by nature. For them, life is not about winning; it’s about building relationships, finding harmony, being kind and putting forth the best version of yourself each day. Who do you know that falls into this category? Leaders of this third type of person should look for ways to utilize them in support roles where their noncompetitive nature will not be an issue. Every company needs to have some solid role players. It’s a competitive environment, and engaged employees compete to win. 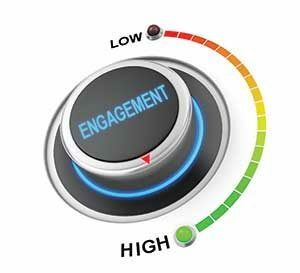 How engaged are your people?